It’s friday night, weekend has just begun and you and your friends are looking for a nice bar, club or restaurant to drink some beers. But where to go to? 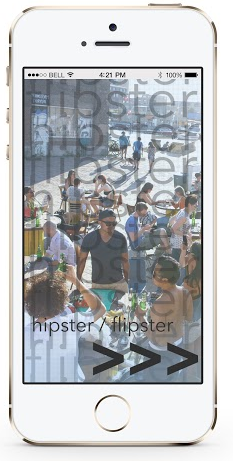 Just download the HipsterFlipster app on your cellphone, and your wanderings for new places are history! From left to right: the startscreen, the homescreen and the check-in pop-up. HipsterFlipster, easily and for free downloadable via the App store or Google Play store, is founded by six students in order to display an overview of the current restaurants, bars and clubs in Amsterdam East. Amsterdam East can be considered as an upcoming neighbourhood in regard to this sector and to prevent an overload of venues, the list of venues in the HipsterFlipster app is limited to this area (1,2,3). By opening the application the default interface appears: a scrollable, horizontal Hipster (left-side) and Flipster (right-side) bar wherein the venues are equally distributed. By this, the user can sort out a venue of choice, supported by address and a photo of the venue. The order of appearance of venues in the app is not fixed but subject to the amount of check-ins. The left, Hipster-side contains less visited places; the right, Flipster-side contains more visited places. When users are nearby the venue, a pop-up message will ask them to check-in based on GPS location, in order to maintain the continuously changing order of the HipsterFlipster bar. Hence, the bar contains a continuously dynamic of venues to scroll through, and thereby discover, new places. And besides that, the exact amount of check-ins is not visible to the user, as well as who checked-in where so the usage of the app will stay anonymous. Nowadays, online search engines strongly determine what content becomes visible and available to users and are therefore often designated as dominant instruments in the production of knowledge (Vaidhyanathan 2006; Dijck van 2010; Rogers 2009). Google’s PageRank for instance ranks websites based on the amount of visits and links in order to benchmark relevance listed in their top-down list of results. Consequently, this effectuates what has been called a ‘rich-get-richer’ or ‘winner-takes all’ ecology where much-cited sources gain prominence at the expense of sources that are connected to less often (Barabasi 2002; Halavais 2008). In regard to HipsterFlipster, venues like Bar Bukowski or Walter’s are the big winners and overshadow other venues who were not, or much less visible in the result list. Thereby PageRank can be stated as a dominant knowledge instrument. How will users find out about those other venues besides word to mouth advertising? The top-down structure of PageRank is replaced by a horizontal bar which offers the complete list of venues. The motive of the user will decide what side of the app will become their top. This doubles the PageRank concept, because both Hipster and Flipster have their top instead of one dominant top. Also, users can add suggestions via the app, which will be curated by the founders. The criteria for these suggestions is a beer tap and its location: Amsterdam East. Fundamental for our specific design is the much debated, difficult definable subculture of the Hipster which is generally understood as those who reject anything mainstream or trendy, but is distinguished by Youngworks as the Hipster, in search for ‘uniqueness’ and less visited places, and the Flipster, perfectly fine with being ‘ordinary’ and visits more visited places (Plevin 2008; Mathon 2012; Lanham 2008) (4). By this, the Hipster-side of the bar will be less visited: the Hipsters won’t take chances to visit a Flipster place by picking the wrong, Flipster, side of the bar or won’t even check in to keep the place Hipster and unique, which results in a leftish position of the bar. The Flipster, more ordinary, will choose Flipster-places or by checking-in initiate a shift towards the Flipster-side. Also, the amount of check-ins will be listed for thirty days in order to maintain accuracy of the HipsterFlipster formula/concept. Subsequently, based on this definitions of the Hipster and Flipster, a continuously dynamic of venues will evolve. Due to a short-time schedule, HipsterFlipster hasn’t been realised but is still a concept. Nevertheless, programming such an application seems doable since other platforms like Facebook already includes check-ins via pop-up messaging, just as including a venue list, a suggesting feature for venues and an algorithm that sums all check-ins and translate them into a horizontal, dynamic bar. Also, the incentive to check-in is present but not a big reward when you keep in mind that users see all venues anyway. Users really have to feel the urge to find new bars, or are interested in the game aspect behind the app and therefore maintain to check-in. The application is a hypothetical experiment. It is an alternative way to approach ranking. What is problematic is to check if users are using the app according to the definition. The biggest problem of the application is that it is based on user input, but we cannot define user input up front. Thus defining the application from a pure hypothetical view wherein the world is only inhabited by either Hipsters or Flipsters, the users should get a sense of subjectivity from a perspective wherein they approach the application: the perspective is either Hipster, with the top on the left, or Flipster, with the top on the right. Using the theory of Hipsters and Flipsters can be seen as a tool to approach the issue. As a result, the ‘rich gets richer’ effect is critiqued by the interface and workings of the application. At the same time, back-end data can be used by administrators to analyse Hipster or Flipster movement. Though not fully discussed in this blogpost, we acknowledge the possibilities for analyzing (and maybe selling or manipulating) back-end data. The subject is too broad, just as the subject of user-agency as proposed by authors such as Poell and van Dijck (2013). For now, HipsterFlipster is just a hypothetical application rejecting the current PageRank paradigm. (4) De evolutie van de Hipster in de Amsterdamse uitgaan scene’. Youngworks.nl. Barabási, Albert-László . ‘’Linked: How Everything Is Connected to Everything Else and What it Means’’. New York: Plume (2002). Dijck, J. Van, and T. Poell. “Understanding Social Media Logic.” Media and Communication 1.1 (2013). Dijck van , Jose. “Search engines and the production of academic knowledge.”International journal of cultural studies 13.6 (2010):574-592. Halavais, A. “Search Engine Society” . Cambridge: Polity (2008). Lanham, Robert. The Hipster Handbook. Random House LLC (2008). Plevin, Julia. “Who’s a Hipster?” The Huffington Post (2008). Rogers, Richard. “The Googlization question, and the inculpable engine.” Deep search: The politics of search engines beyond Google. Innsbruck: Studien Verlag (2009): 173-184. Vaidhyanathan, Siva. “Googlization of Everything and the Future of Copyright, The.” UC DAViS l. reV. 40 (2006): 1207.